By mid to late spring, the underparts of Philadelphia Vireos can be quite faded. The vibrant yellow tones quite often typical of fall birds fade to a fascinating creamy yellow by spring. In some cases, an isolated yellowish wash occurs on the throat and breast followed by a mostly whitish underside; this combined with the grayish blush to the crown; arcing white brow; and blackish wedge to the loral area provides a beautiful example of subtle beauty. 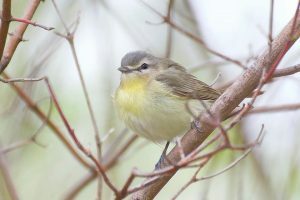 I cannot wait to enjoy some springtime Philadelphia Vireos at Point Pelee in a few weeks time. Photo: Philadelphia Vireo. Ashbridges Bay Park, Toronto, Ontario. 11 May 2015. Owen Strickland. 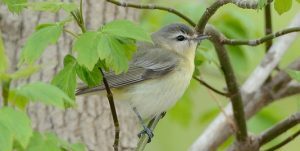 Photo: Philadelphia Vireo. Magee Marsh, Ohio. 7 May 2014. Tracie Kovener. Thank you to Owen Strickland and Tracie Kovener for the use of their excellent photographs. This note is greatly enhanced with the use of their material.